Dar Si Hmad for Development, Education and Culture is an independent nonprofit organization founded in 2010 promoting local culture and sustainable initiatives through education and the integration of scientific ingenuity in Southwest Morocco. We operate North Africa's largest fog harvesting project, providing villages with access to potable water. 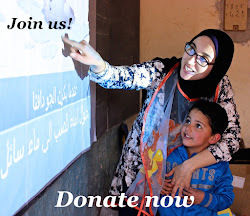 Our Water School and Girls' E-Learning Programs build capacity in the Anti-Atlas Mountains. Through our Ethnographic Field School, researchers and students engage with local communities in Agadir, Sidi Ifni, and the rural Aït Baamrane region for meaningful cross-cultural exchange. With the rise of social media, we live in a world where citizens have more power than ever to share information and news. Citizens are now able to share their observations and thoughts with more people than has ever been possible before. Citizen journalism will become even more important in the future, as we need more voices from everyday people to speak out against environmental injustices that tend to affect marginalized communities disproportionately. For the past decade Dar Si Hmad has been committed to empowering young people and protecting the environment of southern Morocco. Creating a new edition of RISE that specifically focused on citizen journalism and environmental justice seemed like the most effective way to meet both of these goals. 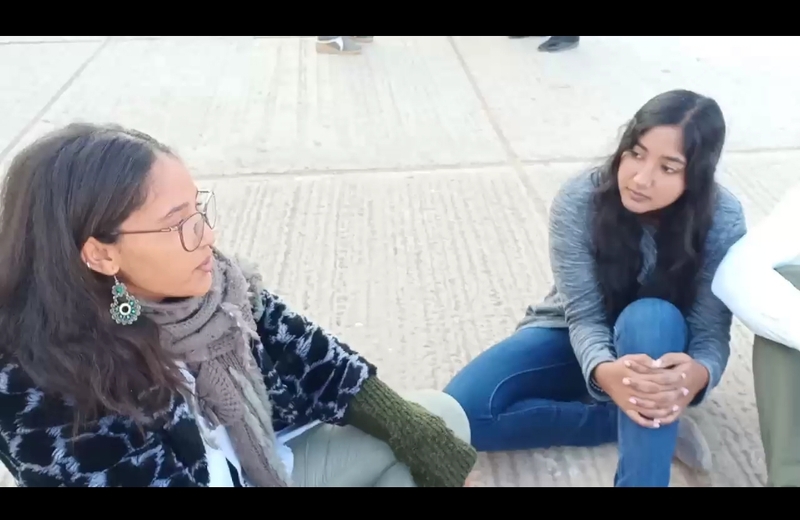 Our vision for this new edition of RISE is to equip young leaders in Agadir with the skills to effectively share stories and information both within their local communities and on a national and international platform as citizen journalists. We have recently wrapped up our first two sessions with our new class of RISERs! During our orientation session, we got to know our RISE participants and discuss our hopes and goals for this workshop series. We played a lot of different games to learn each other’s names and get to know about our interests and aspirations. For one game, we passed around a roll of toilet paper and instructed RISERs to “take as much as they needed.” When we finished passing around the roll, we told them that they had to tell the group one fact about themselves for each piece of toilet paper they took! Besides spending time getting to know each other, we spent time on building a new community of dedicated citizen journalists. We wrote a constitution for the rules that would shape our RISE community and agreed to uphold this social contract. We made goals for our involvement and left with a clearer vision of the kinds of citizen journalists we wanted to become. During the second week of programming, we focused on journalistic ethics. Using the guidelines from the Society of Professional Journalists as a model for our curriculum, we explored the different facets of ethics in journalism. Because Dar Si Hmad believes that students learn more if they are involved in activities and must think for themselves, we included many interactive activities. We had one activity where participants read real-life news articles and had to use their critical reading skills to investigate whether the articles were fake news or real headlines. We also encouraged participants to work together on teams. For our session on minimizing harm as journalists, we presented groups with different ethical scenarios in which they had to decide whether to grant interview subjects anonymity, and if so, how they would take measures to protect their subjects’ identities. Of course, we made time for fun games so that we could continue to bond as a group! We created a BINGO sheet where each square had a characteristic or attribute (such as: “Never had a cavity” “Has three siblings” “Plays soccer”). Participants were instructed to find different RISERs who could sign the different squares that contained an attribute that described him or herself. Whoever could find enough RISERs who fit the different descriptions so that their BINGO sheet had a complete signature in a horizontal, diagonal, or vertical line would win! As a facilitator I also learned a lot from these RISE sessions. All the participants have very thoughtful perspectives on the value and uses of citizen journalism and have articulate visions for how they want to create change in their communities. I am very excited to continue working with our RISE participants on honing their skills as journalists. They already have so many exciting stories to share, so I can’t wait to sharpen their storytelling abilities and work with them to investigate new stories to spread! Preparing for RISE Citizen Journalism 2019! After so many months, the time has finally come to launch our newest edition of the RISE program. Since 2013, during each academic year, Dar Si Hmad offers a training program for various beneficiaries, students, and apprentices living in Agadir that contains workshops, conferences and personal and professional development activities that run for 2 to 6 months. This year marks the seventh edition of RISE program which will be under the theme of citizen journalism. This program aims to offer training on how to use media to promote environmental justice and a wide range of social issues including educational and global topics. This edition of the RISE program will include sessions on citizen journalism ethics, writing techniques, photojournalism, videojournalism, podcasting, broadcasting, and many other interesting topics. This year’s RISE program will be different from the traditional classroom sessions and will instead give the beneficiaries the best knowledge in a welcoming atmosphere filled with dialogue, positivity, and support. At the end of each session, participants will have to do an assignment to apply what they have learned and eventually to work toward publishable contents. Late June will mark the conclusion of the program, participants will present final projects in order to graduate the program. We launched the applications on February 14th. We were surprised by the number of applicants we received and of the high quality of the applications. We selected more than forty applicants to be interviewed. Through the interview, we knew more about our potential risers, their background, their interests and their motivation for the program. After many discussions, we were finally able to decide the foremost and best-suited applicants based on their applications, essays, and performance during the interview. We ultimately selected 24 applicants that showed the most motivation for the program. Dar Si Hmad’s team is really excited for this year’s RISE program on Citizen Journalism, and we can’t wait to meet the participants and for them to start a new journey of knowledge, support, gaining new skills, setting objectives, and experimenting with new approaches that will help them become creators of their own future. In this past two months, Dar Si Hmad has had TWO successful workshops for the Capacity Building Workshop! Our participants have gained so many insights on their experiences and aspirations, and we can’t wait to see how they use their new knowledge to benefit their communities. Our workshop on Organizational Management focused on how NGOs can translate their visions for change into efficient, sustainable actions. While we discussed theories on how to create strategic plans, we also equipped our participants with tools on how to plan for change most effectively. For one exercise, participants learned how to develop SWOT analyses to implement new organizational strategies and changes. The Partnerships and Advocacy Program covered how NGOs can successfully launch awareness campaigns to promote change in their communities. Because we believe here at DSH that you learn more when you’re having fun, we had the participants join in on funny debates. Each of the three groups was assigned to defend the rights of… common pests! One group defended the right of lice, another the right of rats, and the third group represented cockroaches. We then had judges vote on whether the participants gave convincing defenses. We all ended the session laughing, but the participants demonstrated that they had absorbed the trainer’s advice on rhetoric and the elements of a convincing argument. This past month in February we specifically focused on project management and evaluation with our trainer Imane El Ouizgani. We covered project development from its inception to the very last stages of evaluating a project’s success. Participants learned how to conduct a feasibility of a new project with PESTLE analyses and brainstorm their assumptions on challenges and outcomes related to new projects. We also discussed the practical measures necessary for implementing a successful project by introducing the GANTT chart tool. For our daylong workshop on project evaluation, we brainstormed solutions to data collection challenges and thought in new ways about how to find accurate and relevant indicators for projects. We also began to delve into the topic of how to convey the results of projects to different audiences, as your communication of data with your donors, staff, and beneficiaries often requires different focuses. Throughout these sessions we incorporated fun activities to energize our participants and encourage networking. One memorable energizer was when we played some calling and name games on the roof. We might just bring our participants onto the roof again next month for some activities next month, if the weather stays pleasant! Each week we assign the participants homework so that they apply what they have learned in our workshops to improve their own NGOs. Now, as we’re coming towards the conclusion of the training series, we are working more closely with our participants on developing and launching new projects and campaigns. 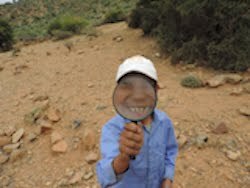 In the next four months we will be seeing our efforts materialize with new initiatives in southern Morocco! Last month we received a group of 18 students from Miami Valley High School at our Ethnographic Field School. We developed a rich curriculum for the students to enable them to understand more about Moroccan life, identities and culture. Our program consisted of lectures, excursions, and activities based on the culture and histories of southern Morocco. 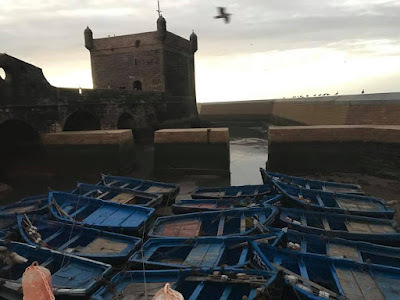 The program's excursions included a visit to our fog project, an old Medrassa in the Ait Baamrane region, Association Aicha in Guelmim, and historical tours of Agadir and Sidi Ifni, led by our EFS Manager and Executive Director. One of the activities is a cultural exchange between the American and Moroccan high school students. This initiative enabled both groups of students to learn new things about their ways of life, to overcome negative stereotypes and to make new friends from overseas. 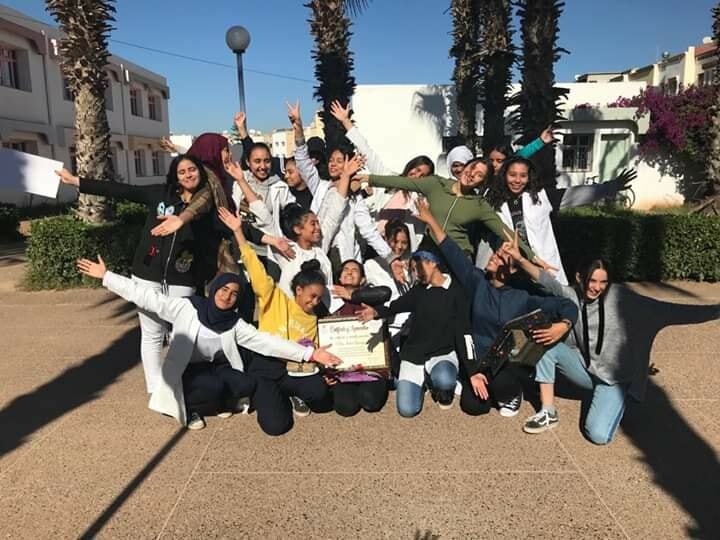 We are very grateful to the Ibn Maja High School administration, its students, and the delegation of national education of Agadir for helping us organize such an enriching activity. “The most fun yet exciting event that our Ibn Maja High School has experienced took place on Friday the 18th 2019 at 9:30 a.m. I couldn't believe that I was going to be a part of that event. When my teacher Mrs. Aaouatif first told me that I was chosen to participate in it, I got extremely excited to meet American students my age, some of whom are now my friends. The morning event started with the American students arriving at our school. They looked like any typical American teenagers, which I was pretty nervous about. Before getting to the core of the event, we got in a circle and introduced ourselves in a fun way so that we could get rid of the awkwardness that was surrounding us. Then, we started to create these small groups of four or five where we had to find common things within the group, which was super entertaining; we sang, laughed, and had an unforgettable time. After a while, we got in groups of three Moroccan students and three American students to discuss the main purpose of the event. 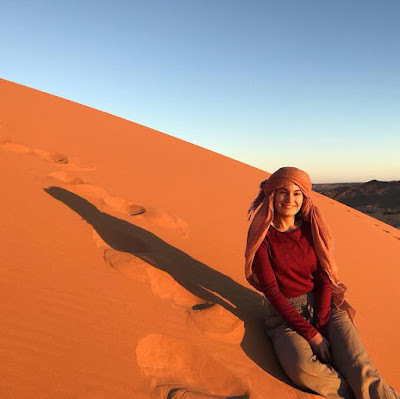 American students reflected on their understanding of Moroccan culture, as well as Moroccan students on American culture. We heard some positive stereotypes from our American friends which surprised us. They said beautiful things about Morocco, the people and how nice they were to them. There weren't really any negative stereotypes. We also shared our perceptions as well. Mostly, it showed how we liked American culture. We liked how open-minded and generous Americans are. Thereafter, we got in a huge circle so that each group could share their final thoughts. 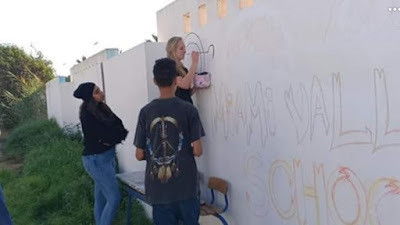 Afterward, we all went to eat from a buffet full of different snacks, and after some of the students went to draw graffiti on the school walls (FYI, we are allowed to draw graffiti in our school), while others went to play basketball. 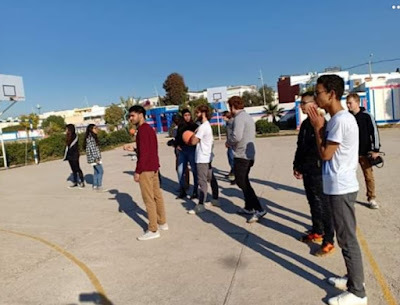 At the end, the students got together to play a football match with American students playing against Moroccan students, which was incredibly fun. Capacity Building Program: First two workshops! A lot of exciting activities have been happening at the Capacity Building Project since we first posted about it! The second week of December marked the second workshop for the capacity building workshop for NGOs after our first workshop on Governance and Administration in November. Our trainer Zineb led a module on Human Resources Management, and our trainer Mustapha led a workshop on Financial Management. We had a lot of ground on management training to cover, and our staff, trainers, and participants rose to the challenge with grace and enthusiasm! When we are planning the content for these workshops, we make it a priority to include interactive activities. We want to be able to hold people’s attention for an entire daylong event after all the participants already been working for an entire week-- so long lectures are not going to engage our audience very well! When I was identifying a volunteer’s motivation to serve, I found out that there are three motivations to volunteer: a spiritual or personal connection to the cause, a desire to build skills or gain experience, and an interest in making social connections. When I was drafting our module on volunteer management, my co-manager Hafida pointed out that Dar Si Hmad has already worked with some strong volunteers who could share their experiences and expose our participants to more perspectives on how NGOs can best engage their volunteers. So, we designed a module where we invited three alumni from Dar Si Hmad’s RISE program, a youth empowerment training series, to adopt the profiles of three imaginary volunteers who had different motivations to serve and currently experiencing some difficulties in their work performance. The participants were placed into three groups and took on the role of an NGO board and had to brainstorm solutions so that they could better engage the different volunteers. Another goal of the Capacity Building Program for NGOs is to get a bunch of smart, ambitious people working to better their communities in the same room together to share ideas. For one session during the Financial Management module, we challenged NGO leaders to work in groups to brainstorm income-generating activities for an imaginary NGO that supports the Mikhaleen, workers who sort garbage for collection and recycling in major cities throughout Morocco. In addition to envisioning creative ideas to support the financial viability of this NGO, participants also had to assess whether this idea would generate a substantial profit for the NGO based on the project’s estimated start up and operating costs. When these participants were trying to brainstorm a feasible income generating activity, they shared their own professional experiences with each other and ultimately came up with a list of ideas that no one participant would have created entirely on his or her own. These NGO leaders are also getting to know each other better over the course of six months, so we hope that they will be creating mutually beneficial partnerships to support each other’s missions. Although a lot of our activities are based on responding to hypothetical situations, we have several strategies to have our participants apply their training in a practical manner. After each session, we assign homework for the participants to use what they have learned to benefit their NGO. One of the assignments from this past session was to have the participants write job descriptions for their staff and volunteer positions. This assignment will help NGO leaders better organize, delegate, and outline workers’ duties and responsibilities, improve their recruitment strategies and provide a template for providing feedback and performance reviews. Each NGO leader has also agreed to launch a new project or campaign based on the management training they have received from the Capacity Building Program. There are so many people at Dar Si Hmad who work incredibly hard each month to make this workshop training series happen. In addition to working very closely with Hafida, Jamila, our Executive Director, provides feedback and guidance on how to structure the content more effectively. We also collaborate closely with our trainers to draw from their extensive experiences in NGO work so that we can share the most critical aspects of management with our participants in the most engaging format possible. When it comes to running the logistics of our program, Hafida and I rely on Dar Si Hmad’s driver and caretaker, Abderrahman, to assist us with ironing out the details, which includes a lot of running errands and literal heavy lifting. Aatika works very hard to provide delicious meals to our participants and staff during the training sessions. There are so many people who have put a lot of time and energy into making the Capacity Building Program a reality, and I am so excited to be working with and learning from so many Moroccan dedicated to social impact. If you are involved with civil society in Morocco and would like to get more involved with the Capacity Building Project, hang tight! We are planning to release a training manual for trainers and NGO leaders written in Arabic at the end of the project. And, hopefully, we will be able to launch a similar workshop training series again in the future. I have just finished my time as an intern at Dar Si Hmad, so I wanted to reflect on the four months I spent here. I am so privileged to have had the opportunity to work with some amazing people on some amazing projects, and I will remember being here as a formative experience in my life. Through Dar Si Hmad, I worked on two main projects, GRACE and planning the EFS 10th anniversary celebration. Both have helped me develop my professional and interpersonal skills. I learned how to be an effective teacher and manage a classroom, while still providing fun and exciting content to make my students interested in the material. I also grew from learning how to continue when things aren’t going my way. With GRACE, I started off with around 40 girls, but due to some scheduling conflicts, about 10 girls had to drop out, leaving me with only thirty students. While slightly disheartening, I was reminded that it isn’t about the quantity but rather about the impact. With EFS, I developed the capacity to think about many different aspects of one project, particularly from the logistical side. What really felt like the most insightful aspect of working here was simply being around the daily activities of a well-functioning NGO. I was surrounded by different ways of thinking, and I got to understand how gears are constantly turning even in the absence of active projects. I feel equipped with these new skills, and I am excited to see how they fare for the rest of my gap year and once I start school. I recently walked past the hotel I stayed in during my first night in Morocco. I couldn’t help but think to myself, “wow, this doesn’t feel so daunting anymore”. Looking back at myself being terrified, too nervous to walk more than 5 feet to a restaurant, and staying hidden in the hotel, I can safely say I have grown a lot. To be completely honest, it makes me laugh. Who was she? I don’t know her anymore. I remember a list of goals I wrote down before coming here, one of which included being able to hold a basic conversation with another person only in Darija, which is the colloquial Arabic spoken here. I am pleasantly surprised with my ability to communicate in Darija now and have learned quite a bit through my language classes with my tremendously helpful teacher, Lahcen. I love being able to come home and talk to my host mother about my day with her being able to understand me (for the most part). 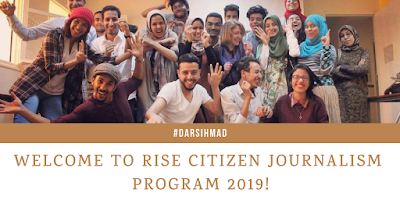 While I am definitely going to miss being at Dar Si Hmad, I know I will be staying in touch with the organization and hope to visit it again in the future. My heart feels happy knowing that I have done good work here, and it has motivated me to continue working on what I hope to accomplish in the future. 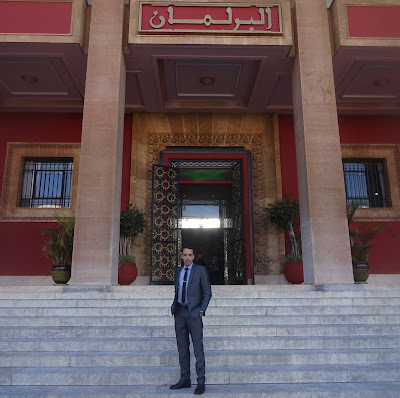 Before I talk about my experience with Model Arab League, a short self-introduction would be helpful. My name is Ayoub Nachat, I am 24 years old, and I am a master's student majoring in Applied Linguistics and Language Studies at Ibn Zohr University. I am an alumnus of the RISE program 2017/2018 edition. The Rise program was very rich and interesting in terms of knowledge and the different opportunities it brought me and other alumni. I found the application form for the conference on Dar Si Hmad's Rise Alumni group. 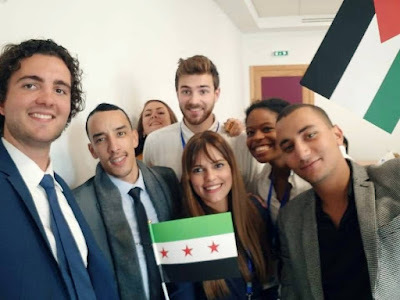 It was a five-page application form where I had to introduce myself, my background, my previous experiences with Model United Nations (MUN) and write four essays on different topics. 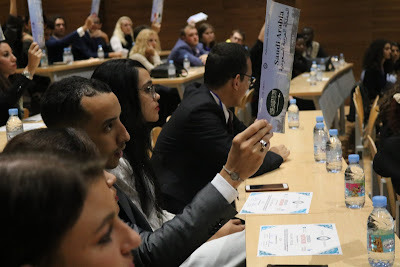 I already had previous experiences with MUNs before as a delegate and a chair as well, but Model Arab League (MAL) was an opportunity for me to go through an interesting new experience. As I expected, this opportunity caused me to notice many differences between MAL and MUN. After filling out the application form online, I passed the first round and I was contacted by Dar Si Hmad's staff to sit for an interview. The interview was smooth and to the point. I was asked by the interviewer, many questions along the lines of: “introduce yourself, why do you think we should select you to be part of the conference?”, and “talk about your previous experiences in MUNs?” She has also explained to me everything that has to do with logistics and what is expected from me as a delegate at the conference. 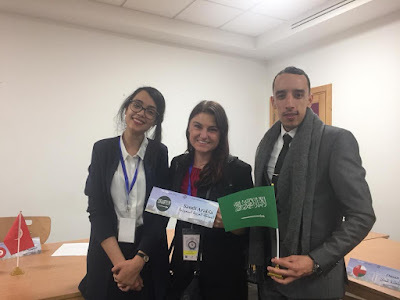 Days later, I received an acceptance email that said I was selected to be the head delegate of the delegation sponsored by Dar Si Hmad and Fulbrighter Anna to represent Ibn Zohr University in UIRIMAL in Rabat. One week later, we started the training sessions regarding MAL's procedures and topics. The trainings were rich, inclusive, and to the point as well, but it would have been better if our university had signed us to participate to have a longer period of training since the other delegations from other countries had started training months before. However, I am still thankful to Dar Si Hmad and Anna who signed us, sponsored us and trained us in a very limited time period. On November 1st, the delegation that consisted of 4 people, University Advisor Anna Cizek, Imane Arjdal, Intissar Blila, and I, left for Rabat. After we arrived the next day, we checked into the Université International de Rabat (UIR) dorms. Later, we went to meet the other delegates in order to go to the Moroccan parliament for a cultural visit. That was a very interesting experience for both Moroccan and other delegates from different countries since we all had the chance to learn many things about the political system of Morocco and how parliament works. I also had the chance to serve as a translator for the guide in the parliament who was explaining everything about the parliament institution, and that was very special and meant a lot to me. Later in the evening, the opening ceremony of the UIRMAL conference started, and different speeches were delivered by the organizers of the event. 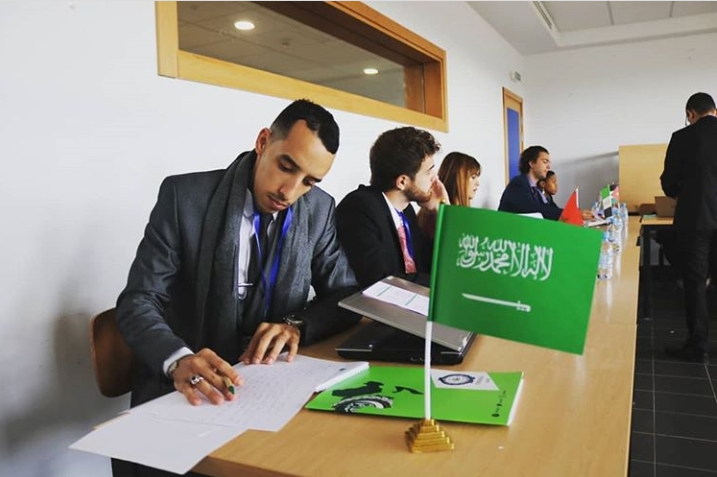 The next morning, we started the committee debates and discussions, and I was very eager to participate as much as possible and defend the stand of the country I was representing, which was Saudi Arabia. I always try to seize such opportunities to develop both my personal and professional skills. I also made many friendships and met new people, and I would like to advise the readers to grow their networks as much as possible in such events. You will meet new people who can really inspire you and make you see the world from another perspective. This conference was different from other MUN experiences I’ve had before. The procedures made me feel a little bit disconnected, but I worked hard to overcome that challenge by getting into debates and lobbying with other delegates. Additionally, I had to prepare for many different and complicated topics in a short amount of time and, luckily, I managed to do that in the free time during the conference. Besides the difficulties I faced, I really loved being a delegate in UIRIMAL. First, I had the chance to meet new young, ambitious, and very nice people. Since I arrived to the university, I never felt alone. In fact, at this moment while I am writing this blog, a young guy I met at this event just sent me a message. Another advantage of this conference that I enjoyed was the academic training. It was not easy to participate in all the debates and discussions through speaking in public, working with others, and negotiating ideas, but I had to really challenge myself to do that and improve both my personal and professional skills. Participating in Model Arab league was a pleasure and a great experience that has taught me a lot and I am willing to make this experience a gateway for other interesting opportunities, both for me and students in my community. Donating through our 501c3 registered partner, Conservation Ink, is tax deductible and guarantees that your generosity will go directly toward implementing sustainable livelihood projects in Southwest Morocco.